I remember a time when the idea of a worldwide computer network was visionary, and the prefix "cyber-" wasn't attached to everything under the sun. Of course, this is all typical fare for our entertainment media. Few things sell copy/tickets as well as a good, old-fashioned story of technology run amok and/or the end of the world. Fortunately, the 80's also introduced us to a few people who realized that expanding technology was good for more than ending life as we know it. These folks realized that, one day, humanity would be embracing all of this new and exciting stuff - and wondered what it would be like if the computers of tomorrow "lived" with us (instead of just ruining our lives in some apocalyptic scenario). Those folks - Gibson, Stephenson, Williams, et al. - took the style and buzz of everyday life in the 80's and instilled into it what at the time was visionary technology. They created "cyberpunk." Now, you know that something must have been cool when contemporary society embraces aspects of it. In this case, we know cyberpunk was truly cool because nowadays anytime someone wants to make technology sound all spiffy and cutting edge, it's labeled "cyber" this and "cyber" that. But there was a time when "cyber" anything was practically unheard of - and when all of this technology we take for granted was little more than a vision in someone's head, or an experiment running in the basement of a few universities. From those days emerged what has to be one of my favorite games of all time (it's at least in my personal Top Five): R. Talsorian's Cyberpunk. Bearing the name of the genre of science fiction literature that inspired it, Cyberpunk had it all: a setting full of violence, old-school themes, and new-school technology - all amidst a stylish flare that could only have burst from the loins of the 1980's. It was a game of modern life sitting on the knife edge of tomorrow. The Cyberpunk system - "Interlok" - was a simple, flexible little gem that seemed to answer any gaming need while still allowing characters all the room to breathe they could possibly require. And it was easy to house rule - perfect for a person like me. Throw in a bus load of Nagel-derivative artwork*, and how could you lose? Thanks for these character sheets. I have a feeling I need to go out and pick up a copy of CP2013. I started with 2020 and haven't ever had a look at 2013, but I keep hearing good things about it. @Superhero Necromancer: You're welcome. 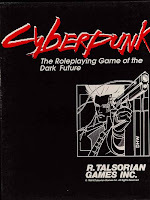 :) I can't recommend first-edition Cyberpunk highly enough - but I feel I should warn you: the combat system in 1E is significantly different than that used in 2020. While I personally love the system ("Friday Night Firefight") it's more complicated than 2020's - it's table-based and uses wound levels, instead of a hit point-style system. I've learned from experience that not everybody thinks this is so hot. Just an FYI. I know CP's stat+skills system has it's flaws, but it's intuitive nature and ease of modification made for an incredibly flexible engine. I must have played variations of it for over a decade. 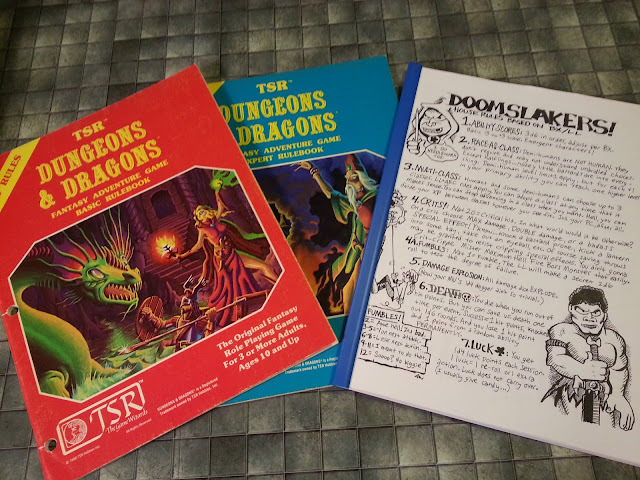 The game's only real drawback was the increasingly munchkin and anime influenced setting. How the same company that produced the excellent "When Gravity Fails" and "Hardwired" worldbooks could default to such a shallow and poorly thought out gameworld is a mystery for the ages. That's a funky character sheet design. Very cool. I played CP2020 for years. 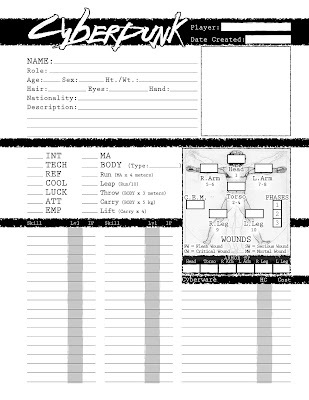 Cool character sheet. The coolest for 2013 indeed. One point however, Random Hit numbers for arms and legs are inverted. @Anonymous: Good point! But that was no accident - that reflects one of the few (in fact, maybe the only) house rules I had for CP 2013. I always felt that a shooter aiming for center mass would have a higher probability of hitting an arm than a leg.